Small spaces are turning into the next big trend in real estate. Due to overcrowding in cities and soaring prices in the housing market, it seems the natural solution is to think smaller. Here are 20 of the smallest homes we could find, from all over the world. They’re on roofs, on wheels, and in backyards. They may make you feel claustrophobic, but their owners have found them to be quite livable. Know of an even tinier living space? Let us know in the comments. This 330-square-foot apartment in Hong Kong transforms into 24 different room combinations. Gary Chang, an architect in Hong Kong, turned his family’s tiny 330-square-foot tenement apartment into a sleek and efficient living space with 24 different room combinations, including bathrooms, kitchens, living rooms, and even a guest bedroom area. 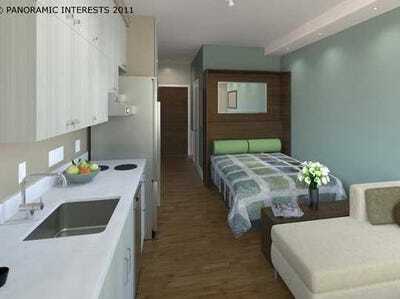 New York City will get 300-square-foot micro apartments. AP Images Mayor Michael Bloomberg reveals the new Living Small NYC project. Last July, New York City Mayor Michael Bloomberg revealed a plan to create studio apartments that will be no more than 300 square feet. These apartments, which Bloomberg proposed to construct in the Kips Bay area of Manhattan, could be an affordable housing solution for young professionals and could hold a kitchen, bathroom, living area, and sleeping area. The affordability is debatable, however, as the micro apartments will still cost around $2,000 a month to rent. 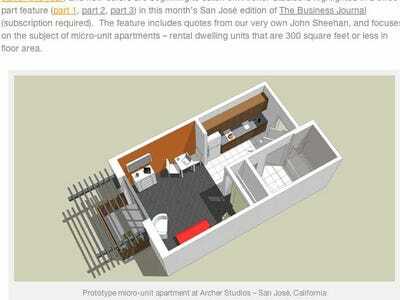 San Jose is also getting its own 300-square-foot micro apartments. here is a long wait list for one of these studios, but at a price of $650 a month, the wait may well be worth it. Twelve Cubed is a company that makes 10- and 12-foot cubed housing units. When James Stuart learned of a homeless woman who died of a fire in her cardboard shelter on the streets of Vancouver, he decided to found Twelve Cubed, a company that designs and manufactures 10x10x10-foot and 12x12x12-foot homes. Each home, which is up to 288 square feet when you consider that it is two levels, has a bed, a living area, desk area, kitchen, and bathroom. It can even come equipped with a washer, dryer and a dishwasher. Stuart himself lived in one of these units for eight months to prove that it can be done, and is hoping cities will be interested in buying them as housing options. This 258-square foot home in Barcelona was once an old pigeon loft. When photographer Christian Schallert moved to Barcelona in 2003, he went searching for the perfect, affordable home. He found it in an old pigeon loft on top of a building, about 100 steps up. When Schallert arrived, the 258-square-foot space was dirty and had not been maintained, but he designed and remodeled it into a warm, open, “Lego-style” apartment. The walls slide to reveal different room set ups. Moving panels hide his kitchen, closet, bathroom, dining room and living room, and the bed is stored under the terrace balcony that overlooks the city of Barcelona. San Francisco is getting tiny 220-square-foot micro apartments meant for two people. This past November, San Francisco’s Board of Supervisors approved plans for 220-square-foot apartments, but only on the condition that they cannot be occupied by more than two people. 375 units of these apartments will be built to help manage the affordable housing crisis in San Francisco, where the average studio currently rents for $2,000 a month. The new micro-apartments would rent for $1,200 to $1,500 a month, which is considerably cheaper, but still surprising for the size of the apartment. 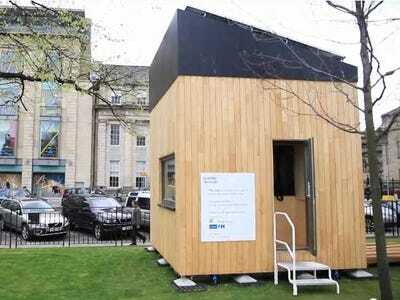 A Yale student built a 144-square-foot environmentally-friendly home instead of living in traditional student housing. When grad student Elizabeth Turnbull was accepted into Yale’s School of Forestry and Environmental Studies, she built her own 144-square-foot tiny house instead of opting for university housing. During the building process, Turnbull made sure to keep in mind the environmental impact her home would have and to minimize any potentially harmful effects by using all FSC-certified wood, non-toxic paints and finishes, and recycled windows. 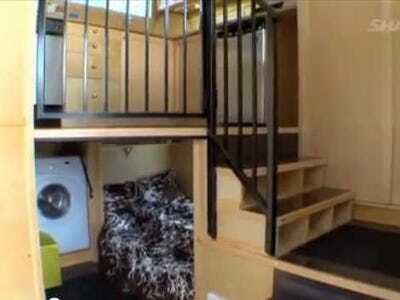 This 112-square-foot mobile house traveled across 9,000 miles. Zach Griffin and four friends decided to take an epic, cross-continental ski trip, and built a 112-square-foot mobile pod house where they lived for the six week, 9,000 mile-long trip. 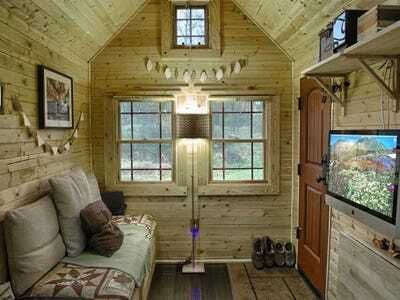 The tiny house has a “drawbridge” bunk bed that comes down from the two-person sleeper loft, and a pull-out sofa bed. 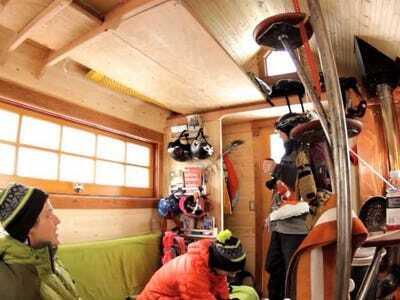 The skiers relied on the kindness of hostels and strangers for bathrooms, as the pod has none. It does, however, have electricity, a generator, and a toaster oven and propane stove as their kitchen. They even made a movie about their trip in their tiny, temporary home. This 104-square-foot home is beautifully designed. Chris and Malissa Tack built their 104-square-foot home just outside of Seattle. They had both been working in the tech industry and decided to leave their complicated, material lives behind and make a clean break, starting with a smaller, simpler home. The home has cut their living cost substantially, and they predict the home will be paid in full in just two or three years. Chris Tack, who now works as a photographer, has taken many beautiful photos of the home, which has a kitchen, living and dining area, bathroom, storage area, and sleeping loft. 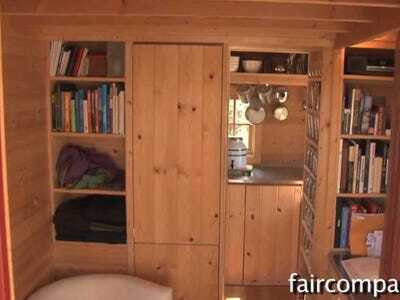 This 100-square-foot environmentally-friendly house will actually earn you money. This home is called the “Eco-cube.” At 10 feet cubed, it’s still sizeable enough to hold a small living room, dining area, kitchen, washer and dryer, a closet, full shower, toilet and full-sized bed. It was designed by Dr. Mike Page of the University of Hertfordshire and founder of the Cube Project, an initiative created to prove that a person could “live a comfortable, modern existence with a minimum impact on the environment.” With solar panels, the Eco-cube can earn you $1,600 a year through the UK’s feed-in tariff. This Manhattan studio measures just 90 square feet. 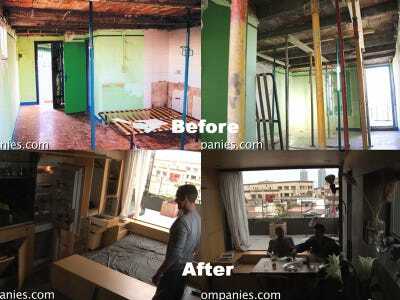 Felice Cohen pays just over $700 for her 90-square-foot micro studio in Manhattan, where a studio could typically rent for an average of $2,569 per month. Cohen, who is a writer and professional organizer, has made efficient use of the space with high, narrow storage units and a lofted bed that is just 23 inches down from the ceiling. The studio has no true kitchen, but Cohen has a toaster oven and mini fridge, which she restocks a couple of times a week. The bathroom, surprisingly, is a decent size. This 89-square-foot home has an “entertainment area,” a kitchen, and even a fireplace. Jay Shafer is the founder of the Tumbleweed Tiny House Company, which constructs small homes ranging from 65 to 874 square feet. Shafer’s own tiny house, at 89 square feet, has an “entertainment area,” a kitchen with plumbing, a working fireplace, shower and toilet, lofted bed, and shelves on almost every wall. This 84-square-foot home cost just $10,000 to build, and even less to maintain. Dee Williams returned from an eye-opening trip to Guatemala and decided to downsize her home from 1,500 square feet to just 84 square feet. She moved out of her big house, built a small one from scratch, and parked it in her friend’s backyard. 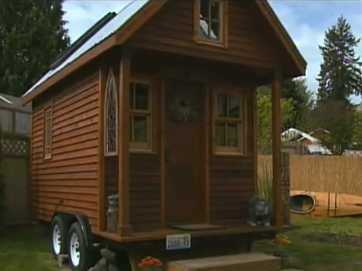 This home, which she calls “The Little House,” cost about $10,000 to build, and even less to maintain. With a propane tank for heat and solar panels for electricity, Williams pays very little to live there. This 80-square-foot home was listed for an incredible $145,000. The 8-by-10-foot London apartment is in a prime location right near the famous Harrod’s department store on Brompton Road. The location may account for the steep price: The flat was originally on sale for $145,000, but more than a dozen offers have been made on the tiny pad.The highest bid is believed to be $280,000 so far, according to CNN Money. 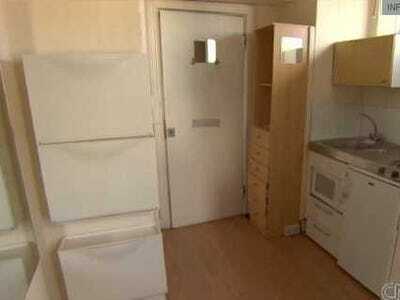 This 60-square-foot home is the smallest house in the UK. 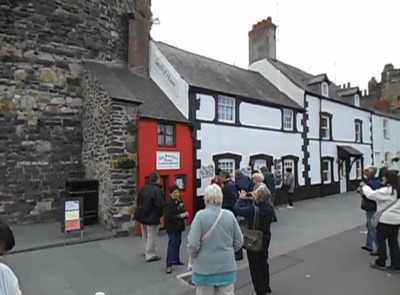 Also known as the Quay House, this tiny red home, which measures just 10 feet by 6 feet, is known as the smallest house in the U.K., and has actually become a tourist attraction in Conwy, Wales. The home has been occupied by various people since the 16th century, including a 6-foot-3-inch fisherman. The house has room for a stove, water tap, bed, and bedside storage. 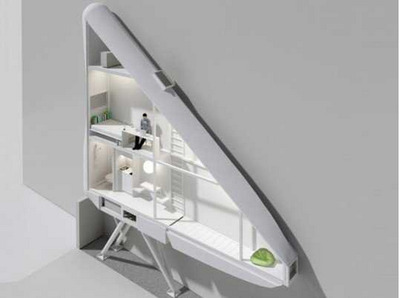 China is building 50-square-foot apartments which are meant for two people. 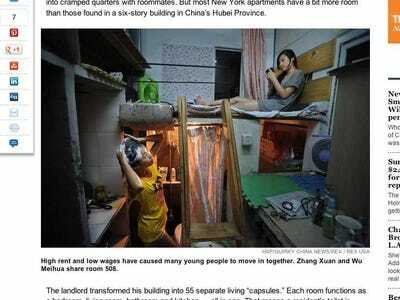 In the city of Wuhan, China, where housing is getting more and more difficult to come by, the city is building 50-square-foot “capsule” apartments which are meant to be shared by two people. One six-story building in China’s Hubei Province has been divided into 55 separate capsules, each of which functions simultaneously as a bedroom, living room, bathroom and kitchen. The apartments primarily house young adults recently out of college who are un- or underemployed. This 5-foot-wide home in Poland is possibly the skinniest apartment in the world. 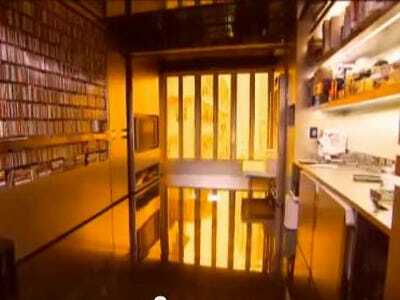 This 46-square-foot apartment in Warsaw, Poland, is just five feet wide, possibly making it the skinniest apartment in the world. Polish architect Jakub Szczesny sandwiched the tiny home in an alley between two other buildings. With no windows, a microscopic fridge, and a shower that aims almost directly over the toilet, this place is as small as they come. The kitchen table has room for two chairs, and the fridge has room for just two sodas. This small home in China is built on top of a tricycle. 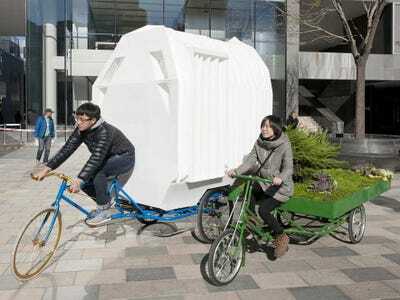 Beijing’s People’s Architecture Office and People’s Industrial Design Office designed and built a polypropylene mobile home so small that it can be folded up, accordion-style, and carted around on the back of a tricycle. The expandable home can attach to others for more space, or to portable gardens to give the appearance of a “yard.” Facilities in the house include a sink, stove, bathtub, and water tank. All the furniture is convertible: the bed becomes a dining table, the countertop becomes a bench for seating, and it can all fold up into the front wall. This 15-square-foot bike camper home was designed to be a residence for the Burning Man Festival. Size: About 15 sq. ft. Location: Black Rock Desert, Nev. 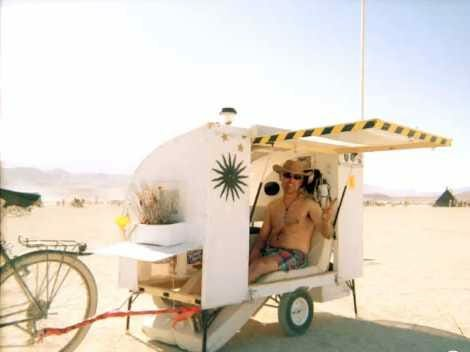 Designer Paul Elkins needed a convenient and eco-friendly way to get around during the Burning Man Festival, so he designed a wind turbine-powered bicycle camper that functions as a bedroom, living room, and kitchen. It’s even equipped with a solar-powered oven. As for the bathroom, you’ll have to resort to the great outdoors for that. Architect Van Bo Le-Mentzal built a one-square-meter (11-square-foot) house which is light enough to pull on its wheels, and provides just enough room to sit or lie down and sleep (but only when tilted on its side). However, that hasn’t stopped governments and private citizens all over the world from contacting him about the plans.